Teammates dog pile on top Jamie Glesson after knocking down the winning kill. Photo courtesy of Washington Missourian. Cape Girardeau, Mo. 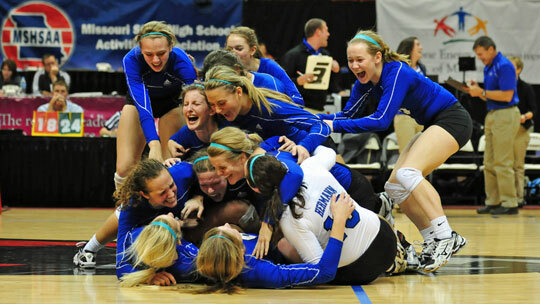 - The Hermann Lady Bearcats won a state record 12th State Championship in two sets over St. Pius X (Festus) 25-22, 25-18. Coach Linda Lampkin picked up her 91st Final Four win and 820th career win. 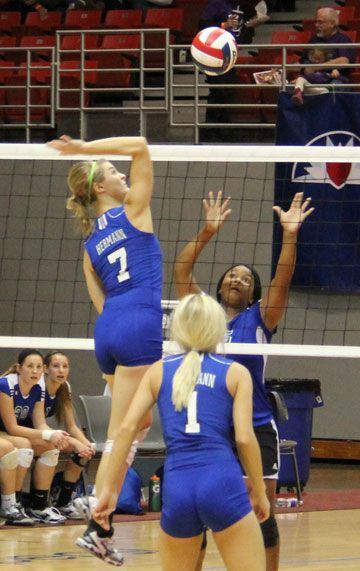 Hermann’s Emillie Diebal had a game high eight kills. Jamie Glesson added eight digs and when her seventh kill feel to floor fans went crazy as players dog pilled on top Glesson. Cape Girardeau, Mo. - We spoke with Coach Linda Lampkin after winning her 12th State Championship in a season where no one expected the Lady Bearcats to advance to the final four yet alone win a State Title. Much more to come including interviews with players and a complete story on the Lady Bearcats amazing two set win over St. Pius 25-22, 20-15. Cape Girardeau, Mo. - Before the Lady Bearcats played their final pool play match they had already secured a spot in Saturday’s Class 2 State Championship; but so had their opponent, St. Pius X (Festus). In their fourth straight final four appearance, St. Pius would hand the Lady Bearcats their only two losses on the day in two very tight matches. 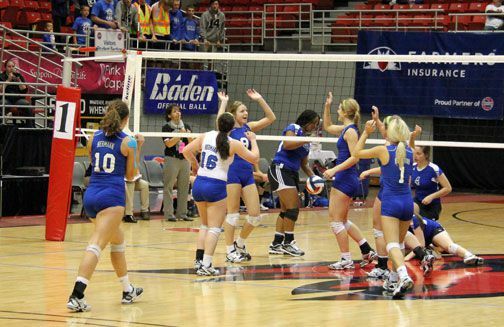 (26-24, 25-23) Setting the scene for tomorrow’s State Title match, which we expect to be a “dog fight”, the last time these two teams met was in 2010, where Hermann knocked off St. Pius in two sets to claim their 11th State Championship. Hermann began the morning with an easy two set win over Fair Grove, 25-15, 25-17. “I felt like we played pretty well even though we were a little nervous starting off, especially in the first set,” Coach Linda Lampkin said. Cape Girardeau, Mo - The Lady Bearcats will play St. Pius X (Festus) in their final pool play game, which will be a prelude to tomorrow’s Class 2 State Championship Match at 3 p.m.
With both teams sitting at 4-0 heading into today’s final pool play match, regardless of the outcome Hermann will go for their 12th State Championship. This will be the 18th time Hermann will have played for a State Title. Hermann, Mo. - This morning students lined up out side Herman High School, cheering on their Lady Bearcats as they departed for Cape Girardeau, making their 21st appearance in the Missouri State Volleyball Final Four. Union, Mo. 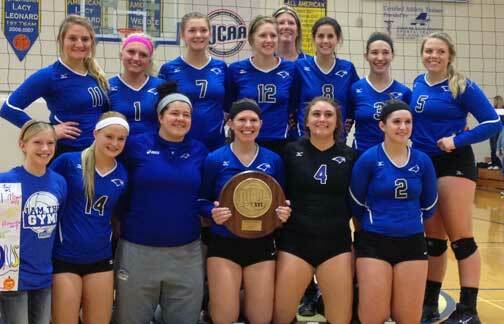 - The East Central College volleyball team won the National Junior College Athletic Association Region 16/District P championship last weekend, securing the Falcons fourth trip to the NJCAA Division II National Tournament later this month in Toledo, Ohio. The Falcons defeated Wentworth Military Academy in the regional finals, avenging a regular season loss to that team. They advanced to the tournament championship with an opening round victory over Cottey College and a four set win over Northeastern Oklahoma College in the semi-finals. 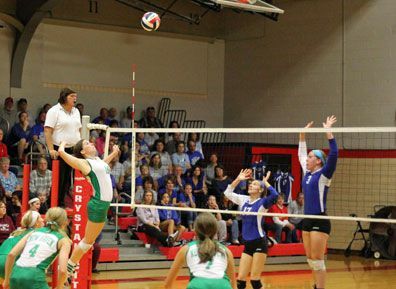 Senior Emily Kallmeyer records team high seven kills. Crystal City, Mo. 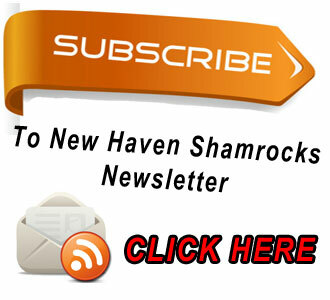 - For the second straight year the Lady Shamrock’s (23-13) season came to a disappointing end at the hands of Valle Catholic as they fended off New Haven’s late set comeback taking the District semifinal match 25-20, 25-22. (2)Valle Catholic (24-8-1) went on to beat (1)Bismarck (30-4) in three sets but would lose Winona (27-9) in the State Quarterfinal after beating Spokane (21-10-2).